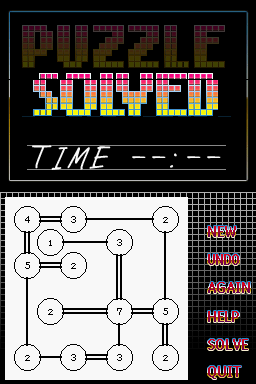 PuzzleManiak is a port of the marvelous Simon Tatham's Portable Puzzle Collection on Nintendo DS. All 27 games are ported on NDS: Tents, Dominosa, Mines, Bridges, Light Up (aka Akari), Pattern (aka Picross), Net (aka Netwalk), Untangle (aka Planarity), Sudoku (aka Solo), Galaxies, Slitherlink (aka Loopy), Blackbox, Mastermind (aka Guess), Map, Filling, Solitaire (aka Pegs), Sixteen, Fifteen, Slant, Rectangles, Netslide, Samegame, Unequal, Flip, Inertia, Twiddle and Pyramid (adaptation of Cube). This file has been rated 4 out of 5 based on 6 ratings and 6 user reviews.